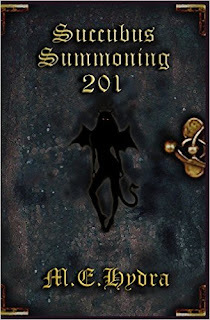 As promised, here is the whole sorry saga of why it took so long to make the print version of Succubus Summoning 201 available. 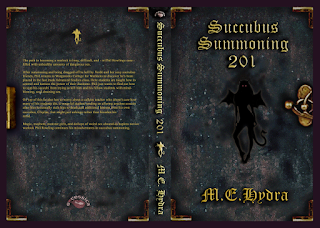 First off I should go through the process I follow to make print versions of my books available for readers to buy. My publisher, eXcessica, uses Amazon's CreateSpace to produce Print On Demand paperback versions of their books. The files they need from me, the author, are a correctly formatted manuscript and a high resolution pdf of the coverflat. I'll go over what the dotted lines and other stuff means in a mo. First there's the obvious dependency - CreateSpace can't give you this template until you know the total number of pages in your book, and you won't know this until you've finished and correctly formatted the manuscript. This is a problem for people like me who have an unfortunate tendency to push our deadlines rather fine. When I get caught in a time crunch, my usual approach is to focus on making sure the ebook version is ready in time and then try to get the print version done as soon after as possible (the manuscripts are formatted a little different - nothing major, but it does take a little fiddling around). As a result the cover art is done backwards. 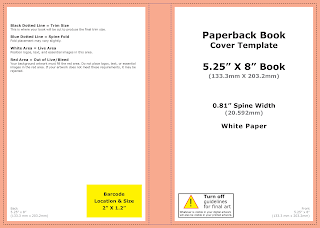 Rather than getting my artist to create the full cover art and then cutting out the front cover part to serve as the ebook front cover, I have them create the front cover first and then give them the full template to do the rest as soon as I have it. 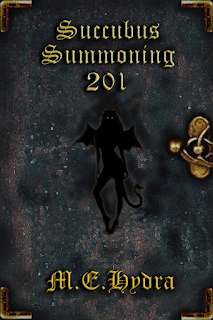 For the ebook cover this is relatively straightforward as the artist knows the exact margins and where the exact edge of the cover is. For the print coverflat is becomes a little more complex. If you look at the template above you'll see there are dotted lines and a salmon-pink border. The dotted line indicates where the cover will be cut out, but this is not 100% precise, hence the salmon-pink border. This represents the bleed area and everything in it is a sort of Schrödinger's artwork - it might get cut off and not appear on the final cover, but you have to have something there in case it doesn't. So this something should look okay enough that you don't mind it being on the front cover, but also shouldn't be important enough that it has to be on the front cover. I should also mention at this point that my cover artist is also my brother and he volunteers his time for nothing more than thanks and beer. As he has a family and full-time job, he only has the spare time to work on things at his own pace. This means that turnaround times are going to be, by necessity, slow and inconsistent. The first mix-up was with the dimensions. The correct dimensions for the coverflat should be 3468 x 2475, 600 ppi. The coverflat template comes with a resolution of 300 ppi. In between our respective art programs we managed to get stuck between the right resolution but four times the size, or the right size but the wrong resolution. I found this out after sending a ridiculously huge file to Stacey, the assistant at eXcessica, that took some finangling to even send it through email before she realised it was way too big for CreateSpace. We managed to get that sorted and then the bleed area problems hit. 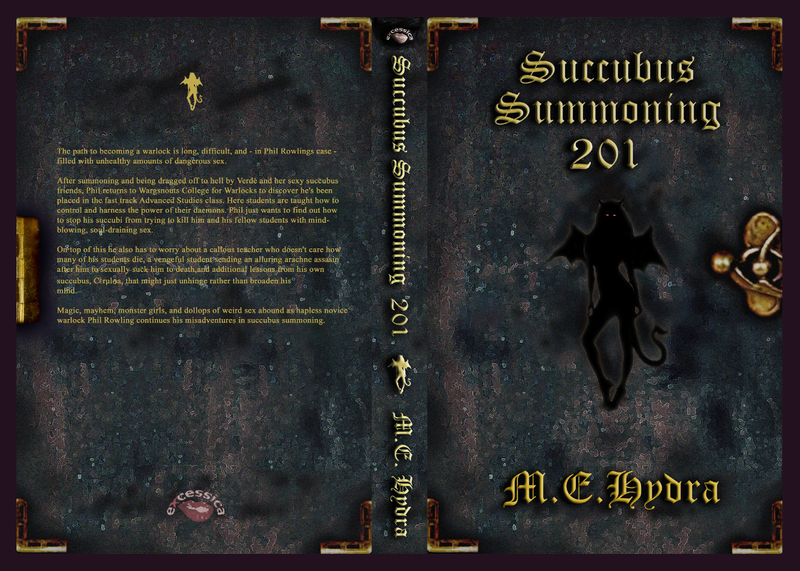 The next submission was rejected by CreateSpace for having text too close to the edge. This was where I managed to confuse my brother. He misunderstood what I meant by having a bleed area around the edges and his first fix was to increase the size of canvas to add a bit around the edges. This doesn't work as the cover is still going to be cut out at the same dotted lines. 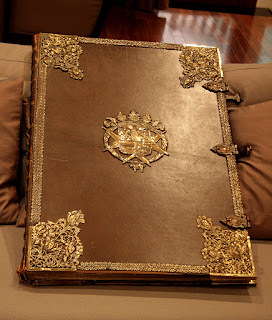 The next attempt had the right-sized canvas and the blurb on the back moved away from the margins. It also positioned the corner ornamentation right in the bleed area. When I overlaid the template I saw straightaway that virtually all of the corner pieces would be cut off, and sent it back. My proposed fix was to position the whole coverflat inside the salmon-pink border and then fill the edges with background cover. I wanted to extend the pseudo-metal ornamentation to the edges, so I told my brother to widen them to fill out to the edges. This didn't work either as Stacey came back to say the coverflat had been bounced again for having essential art bits within the bleed area. I asked her if we could just overrule it as I didn't mind if some of it was cut-off. Unfortunately this was something she didn't have any control over. My guess is CreateSpace has some automated checks on the cover art. So there you have it - less of an excuse and more an acknowledgement of me and my brother being giant idiots. Anyway, I hope you enjoyed this little peek behind the scenes of the publishing process. Thankfully, there is a happy ending. 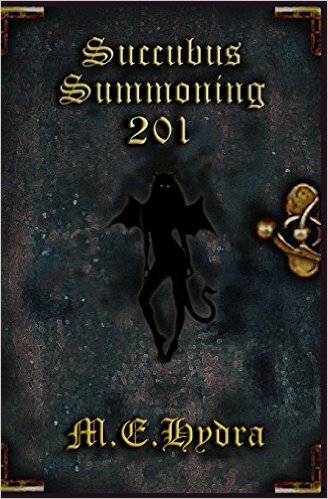 As I posted on Monday, the print version of Succubus Summoning 201 is now available to buy on either Amazon, or directly from CreateSpace. Sorry for making you all wait so long! I feel your pain. I so went through this early on with my vanilla books. It still irks me how Createspace can get it all centered near perfectly when I'm ordering one copy at a time, though, but a multicopy order usually arrives with the cover centering seriously varying. 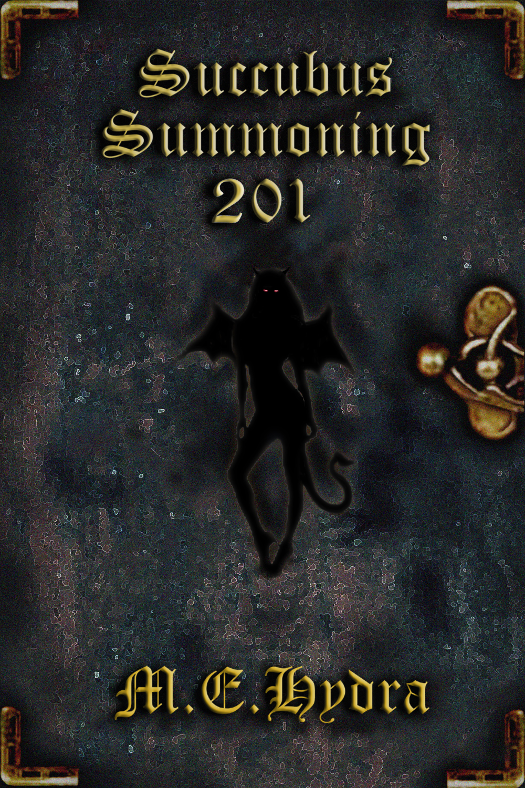 Reading "Succubus Summoning 201" now, by the way, and thoroughly enjoying it!